Tony Conrad, the founder of about.me, says it’s time to disrupt the business card. He’s released a new app today called Intro to do just that. “You don’t always have a business card with you, but you always have your phone,” Conrad explained over the phone. “This takes what we have with About.me and makes it a digital business card for mobile,” Conrad said. Intro gathers the information you have on your personal about.me page, such as your picture and contact info, and puts it front and center on the app. You can then share that information with others. You choose what information you give out to others on the app. One person might be privy to the whole shebang — your cell, office and email. Another person maybe just gets your Hotmail address from nine years ago. 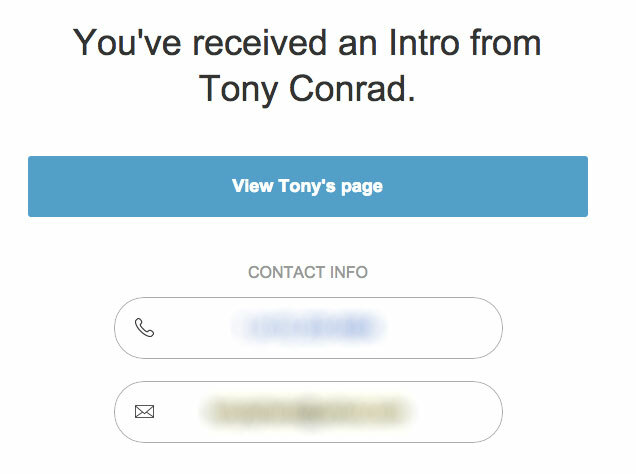 Once you’ve selected what information you’d like to share, Intro sends it to your new contact via email or text message. “It solves the problem business cards have today. You maybe don’t want to give everything out,” Conrad tells me. He says he’s been carrying three different cards around with him to every conference and hands out the right information on each card, according to the person he’s been speaking with. Some of you may remember about.me tried to reinvent the business card a little while back with a partnership it had with Moo cards. But those were still physical cards. This is a whole new way to share info, via your smartphone. Intro solves another problem: putting a face to a name. “It seems a little weird to put your picture on a business card,” says Conrad. “But I started doing that and now I’m used to it.” Now the same thing is available on a digital about.me contact via Intro. It can help you remember what the person who gave you their contact actually looks like. That’s definitely a critical change. How many conferences go by with contact info exchanged only to totally forget who a bunch of people were and what they looked like? This could potentially take on LinkedIn as a business reference rival. LinkedIn currently has a slew of standalone apps for news, sales and recruiting. One, aptly called Connected, is clearly intended for contact exchange. “We’re not a competitor to LinkedIn,” Conrad tells me. He would like to believe there is not a true competitor to his new app, but admits the resume portion in Intro comes close to what LinkedIn offers. All of the information you send or receive is also stored within the app and organized into “My Shares” and “Shared With Me” for easy reference. “We created Intro so that the first time you meet someone – the most critical part of building a new relationship you can leave an impression that actually communicates your identity and is remembered long after that first exchange,” Conrad explains. Intro is available for download in the App Store, starting today.